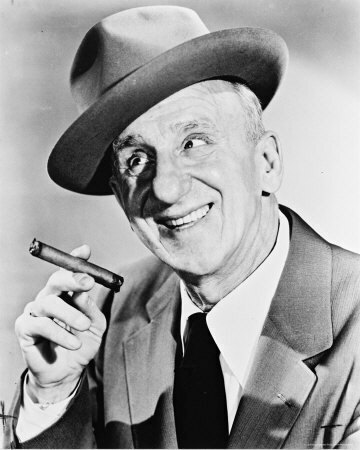 Jimmy Durante was a beloved comic star of vaudeville, radio, movies, nightclubs, and television. 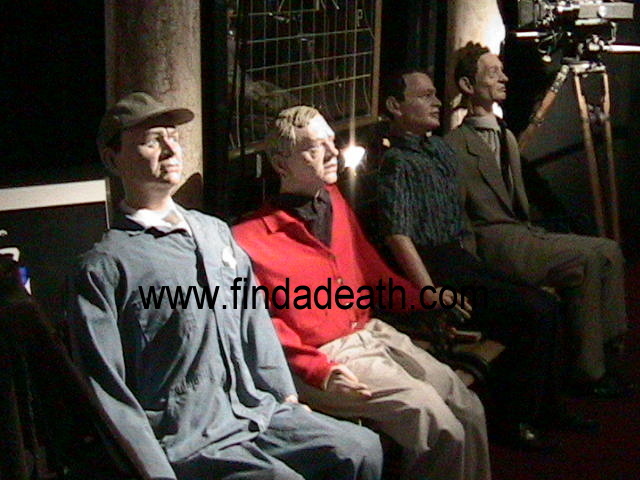 His showbiz career spanned fifty years. Born in Little Italy to Italian immigrants, Durante dropped out of school by 8th grade and became a ragtime pianist in the saloons and burlesque houses of Harlem and Coney Island. Eddie Cantor suggested that Durante stand up and throw insults at the band’s drummer to liven up the show. The sound of laughter immediately hooked the shy Durante. His later vaudeville success led to Broadway and he became a smash in Billy Rose’s Jumbo in 1935. With his short stature (5′ 7″), big nose and big New York accent, Durante comically mangled words and phrases in his act and charmed audiences with his raspy singing voice. His songs “Inka Dinka Doo“ and “Make Someone Happy” would become American classics. 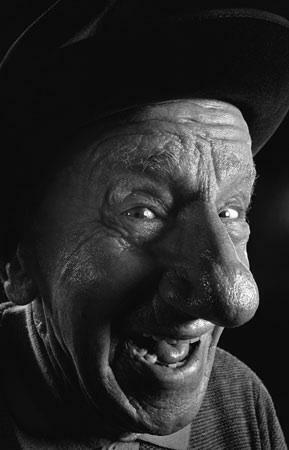 Durante, now known as The Great Schnozzola or The Nose, also had several popular catchphrases, including: “Ha-Cha-Cha-Chaaaa!”, “Dat’s moral turpentine!”, “Everybody wants ta get inta da act!”, and “Dat’s my boy dat said dat!” along with his sign off: “Good Night Mrs. Calabash, Wherever you are.” He later revealed in 1966 that the mysterious Mrs. Calabash was a pet name for his first wife of twenty years, Jeanne. After the death of his wife in 1943, Durante continued appearing on radio and films and by the mid-1950s he was performing in Las Vegas with his sidekick, Sonny King. Jimmy could be seen regularly outside of the Guardian Angel Cathedral alongside the priest greeting his fellow parishioners after Sunday Mass. Carmen Miranda made her final public appearance in Durante’s club act. She had become breathless and fell while dancing during the August 5, 1955 performance then they laughed it off on stage. 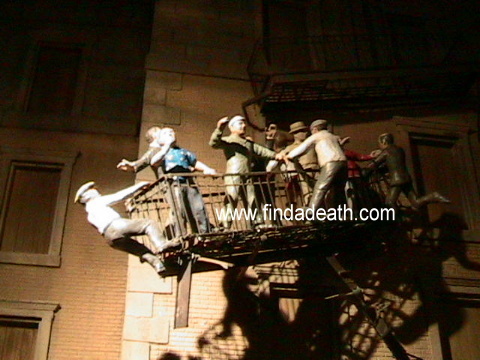 Miranda died the next morning from heart failure. Some say you can see it happen around the 3:50 mark of this Youtube video. Durante also helped raise over $20 million dollars for handicapped and abused children through his affiliation with Fraternal Order of Eagles and the Jimmy Durante Children’s Fund. Christmas Day, 1960, Durante, age 67, married 39-year-old Marjorie Little with whom he had befriended in 1944 when they met at the Copacabana where she worked as a coat-check girl. 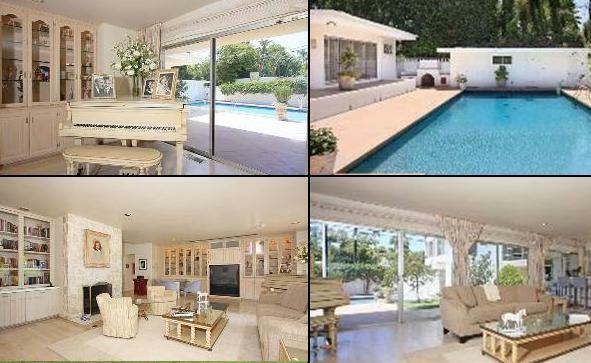 The couple settled into life in Beverly Hills in this home and adopted a baby girl whom they named Cecilia Alicia. 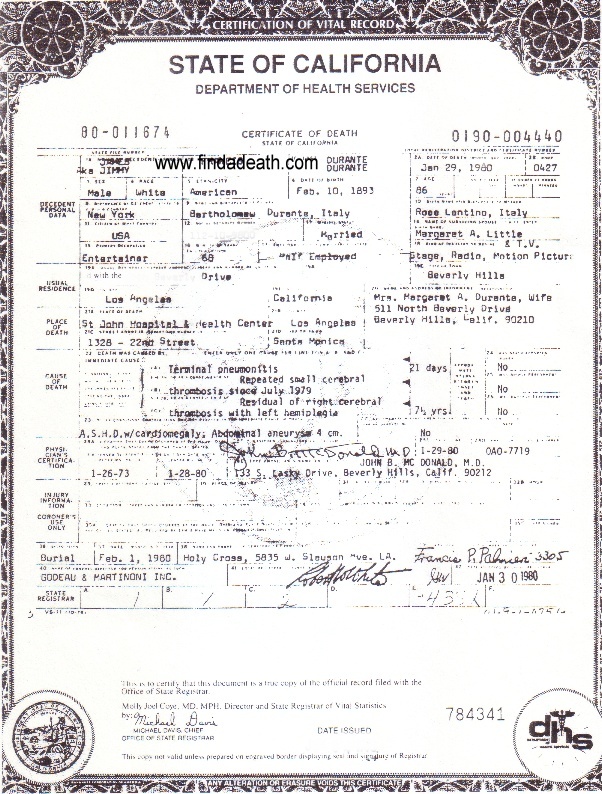 Lucille Ball was CeCe’s Godmother. Margie and Jimmy were also at Madison Square Garden when Marilyn Monroe sang “Happy Birthday” to Kennedy. complete with horrifying papier-mâché figures that were thrown from it. During the 1960s, Durante became known to a generation of kids who saw him portrayed in several Looney Tunes cartoons that reran on TV constantly. 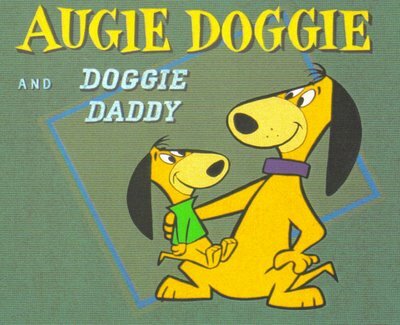 His voice was mimicked by Spike the bulldog in Tom & Jerry cartoons as well as by Doggie Daddy in Hanna-Barbera’s Augie Doggie and Doggie Daddy. 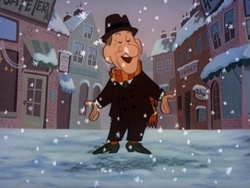 Durante played himself as narrator in the 1969 Rankin/Bass animated holiday special Frosty the Snowman. Durante was also one of the many celebs who attended RFK’s funeral in 1968. He also teamed (at age 76) with The Lennon Sisters, after their father’s murder, to headline on a TV Variety Show for one year. Durante suffered several strokes in the 1970s and retired from showbiz except for a Volkswagen TV commercial where he declared the Beetle had “plenty of breathin’ room for da old schnozzola!”. 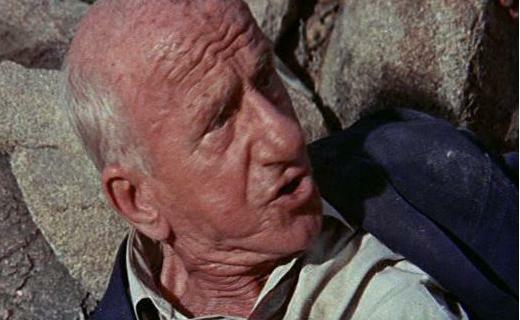 Trivia: He is referred to in the Cole Porter song You’re the Top. And More: He gave Anissa Buffy Jones an Eskimo kiss on the 1967 Emmy Awards. (I bet she was thrilled). Blech. How’d you like to have that rubbing your cheek? *shudder*. Still More: He appeared in a 1960s commercial for Scotties Tissues, calling them “Three Sneezers”. 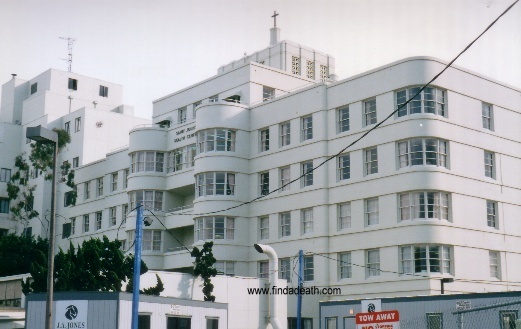 Jimmy Durante died from pneumonia at Saint John’s Hospital, Santa Monica on January 29, 1980. 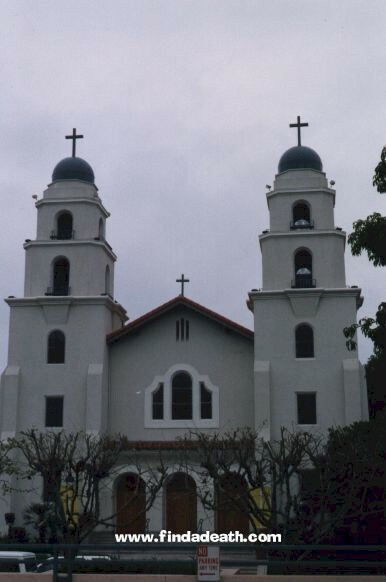 His funeral was held at the Good Shepherd Catholic Church in Beverly Hills. Coincidentally, so was Carmen Miranda’s. 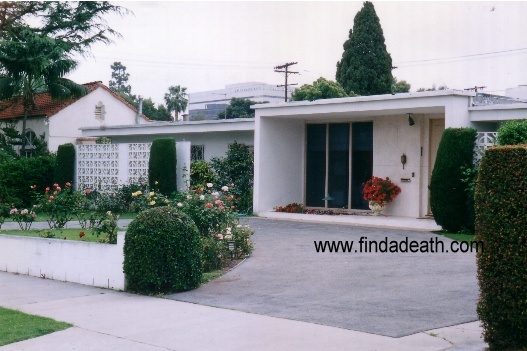 He is buried at Holy Cross Cemetery, Culver City. 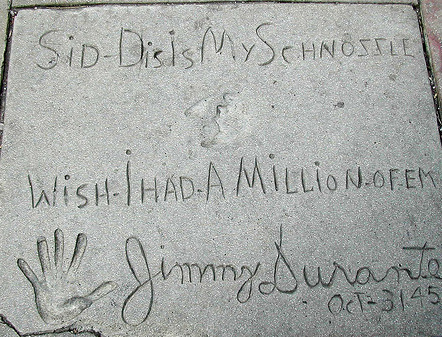 Jimmy left the imprint of his nose on Halloween 1945 at Grauman’s Chinese Theater. A few years ago, I snapped an unusual picture of Jimmy Durante – I honestly do not recall where. Maybe a hotel or a restaurant? Vegas sorta rings a bell? 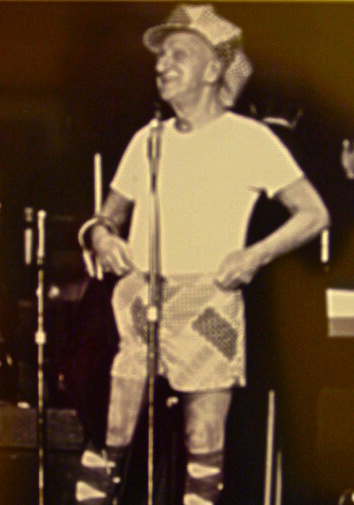 Anyway, this is Jimmy as a hottie in shorts. Yum. “You could warm your hands on this man”.